Lama Zopa Rinpoche during the Light of the Path teaching retreat, September 2009. I’m very happy to meet you, especially knowing that you are helping other people, taking other people’s pain onto yourself, their sickness. In Buddhism this is called exchanging yourself for others. This practice of exchanging self for others is one of the most important practices of Mahayana Buddhism. All the sufferings and problems come from cherishing the I. All the obstacles, all the unfortunate things – even the discomfort of a mosquito buzzing, making a sound around your ear, on your nose, in front of your eyes, and then biting you, or a small tiny ant who bites you on the feet, on the small toes – come from the I, from the selfish mind that cherishes the I. All the bad things come from the I, so we need to give that up. We need to throw that away immediately. Enlightenment, the cessation of all the gross and subtle defilements, the cessation of all the mistakes and completion of all the realizations, and liberation from the oceans of samsaric suffering and their causes: karma and delusion – all these are ultimate happiness. Temporary happiness is all the happiness of future lives and even this life’s happiness, all the comfort – even the comfort of cool air passing through when you feel hot. All the collection of goodness comes from the good heart, from bodhichitta. Bodhichitta and the good heart come from cherishing others. Every single happiness up to enlightenment and every single comfort in this life comes from others. Therefore, others are the most precious ones. Therefore, cherish others. This is what made Shakyamuni Buddha achieve full enlightenment. From this bodhichitta – the ultimate good heart – and from renouncing the I and cherishing others, Buddha ceased all the gross and subtle defilements of mind, which has no beginning and continues from beginningless rebirths, and from this bodhichitta, Buddha completed all the realizations. After one achieves enlightenment, in every second one is able to liberate numberless sentient beings from the sufferings of the lower realms (hell realm, hungry ghost realm, and animal realm). Even in one second, one is able to liberate numberless sentient beings from the oceans of samsaric sufferings and their causes: karma and delusion. Even in one second, one is able to liberate sentient beings from lower nirvana, that lower blissful state of peace for oneself, and bring numberless sentient beings to enlightenment. Even in one second, one is able to liberate the numberless sentient beings from the extremely subtle defilements and bring them to enlightenment. 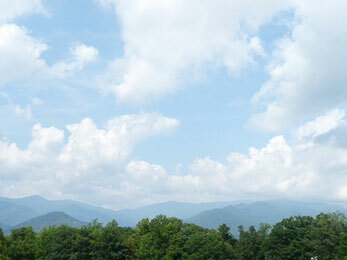 So like this, you are able to offer inconceivable benefit to sentient beings, skies of benefit in every second. What you are practicing – exchanging oneself for others – is unbelievable, great! I rejoice in you! This is what makes your life most meaningful and most beneficial for numberless sentient beings, for every sentient being, and this is what makes the happiest life for you. There is no regret in the future, no regret when you die, and you have the most happy death. Each time that you do this practice, this is what purifies negative karma collected from beginningless rebirths, those very heavy negative karmas. Each time you do this practice, many eons of past life negative karma get purified and you collect inconceivable merits. This makes each day of your life so meaningful. Your meditation makes your life meaningful. Your parents who looked after you, who gave birth to you, all the people who bore so much hardship to bring you up and created so much negative karma, who suffered so much for your well being, for your happiness – this makes all their efforts meaningful, so worthwhile. Scribed by Ven. Holly Ansett, October 6, 2009. Lightly edited by Ven. Gyalten Mindrol. When she received the September issue of the FPMT News, Ven. Thubten Labdron, director of Root Institute, sent this feedback: “Really good e-newsletter, thanks, very readable and lots of inspiration” – and she made sure to add that the praise was not because the News featured Root Instute’s snake charmer! Rinpoche during a knock-out teaching on emptiness at the Light of the Path retreat at Black Mountain, North Carolina, USA, September 12, 2009. We are very happy to welcome our new Finance and Administration Director, Sarah Pool. Sarah is originally from Portland and has a M.A. and a B.A from the University of California, Berkeley, coupled with two years of leadership and management experience as a Financial Advisor in Merrill Lynch’s Global Wealth Management division. Sarah majored in Religious Studies major at UC-Berkeley, and is a practicing Mahayana Buddhist. Light of the Path (LoP): The (fabulous) live retreat with Rinpoche is over, but the entire retreat can be viewed on the FPMT Media Center! 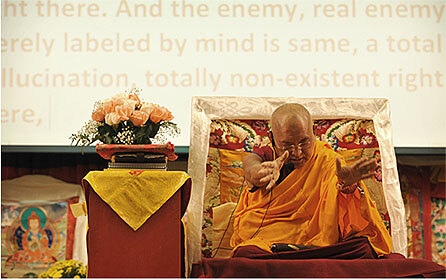 To watch the videos: First, access the FPMT Online Learning Center. Halfway down you will find the link for the FPMT Media Center. Next, choose a language (the default is English, but there are translations in Spanish, French and Chinese, which include the instructions on how to use the media center). 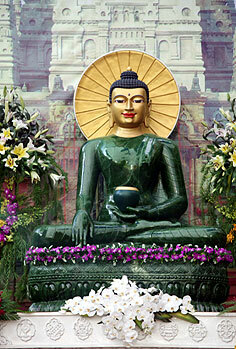 Video recordings of the teachings can be watched at any time and will remain on this site for a long time to come. However, the videos are not downloadable. To listen to the audio recording: You can also listen to the audio-only recordings on the FPMT Media Center. To download the audio-only recordings, go to the FPMT Online Learning Center homepage and choose Light of the Path program. You will need to create a username and password for entry into the site. Once logged in, scroll down and you will see all the audio teachings listed by day. These can be downloaded as MP3 files. You can also download a copy of the unchecked transcript (intended to aid understanding of the video and available in English only). Please enjoy all of it! LoP course materials to be followed online or in centers with an LoP facilitator will be developed soon. Stay tuned! The long awaited reprint of the FPMT Foundation Training in Rituals is now available! Re-titled Ritual and Realization, the book provides detailed instructions for leading all the main pujas done at FPMT centers, according to the advice of Lama Zopa Rinpoche. Education Services has also re-issued the LYWA book, Direct and Unmistaken Method, adding a new motivation from Lama Zopa Rinpoche. With commentary by Lama Zopa Rinpoche, Ganden Trijang Rinpoche, and Gen Lamrimpa, this book is an indispensable guide to the practice of taking the Eight Mahayana Precepts. Both books will be available from the Foundation Store shortly! Recently, we wrote to say that we will once again make an announcement through the FPMT listserve every month when the new FPMT News is released. From March 2009 we had stopped relaying that information to the FPMT and CPMT Yahoo! Groups, and instead, asked for those who are interested in the FPMT News to subscribe to it. But there was some feedback that that announcement had slipped the attention of most people. When the recent announcement went out, it was met with positive comments, including one from Ani Fran of Kopan Monastery, who said, “Dear Doris, I am so glad that the FPMT News is reinstated – I also missed the news!” As we had never stopped producing the FPMT News, it only goes to prove how much the monthly announcement matters! Did you know that Mandala publishes several excusive articles online in addition to the print and eZine features? Check often for new articles and offerings. The October-November 2009 online content is now available. With the help of this multi-media format, Mandala is now publishing nearly 1,000 pages of content every year. In addition, you can keep up with Mandala on Facebook and Twitter. World-renowned eye surgeon, Dr. Sanduk Ruit, who has pledged to train the Amdo Eye Center staff and oversee its operations for two years. FPMT has sent its final payment for the actual building of the Amdo Eye Center. Thank you to everyone who helped to make this possible. In August, FPMT sent a representative to check on the progress and the report back was very inspiring. 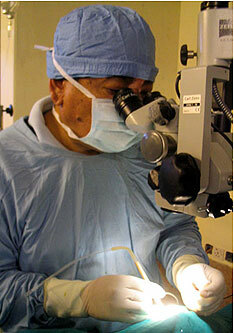 The Amdo Eye Center is already training staff and will soon begin outreach for microsurgery eye clinics in other remote areas. We hope to be able to fund the hospital at least for the next two years. Recently we received a detailed budget of costs for the next two years including items such as the use of a cross-country vehicle (to be able to take doctors to the remote areas), office equipment for the doctors and staff, medical equipment and salaries. The total budgeted cost for the first two years is US$338,000. Please consider making a contribution today to this incredible project that is literally changing people’s lives! The FPMT Display Pack was launched at CPMT 2009 in response to requests from members for a visual representation of the history of the organization, and its essential mission and values, which can be posted on the notice board for visitors and members. As the feedback at the CPMT was unanimously positive, the Display Pack has been posted in the FPMT Affiliates Area for easy download. The INDD file format also facilitates text translation using the same design. One of the comments heard at CPMT 2009 was that we need a stronger publicity/ marketing team at the International Office. As always, we work under the strain of limited resources but whatever we have, we can make the most of, and the Display Pack enables centers, study groups and projects to get mileage out of the FPMT brand which enjoys a good reputation in the Buddhist milieu. It also helps to build a ‘one family’ feeling for our members travelling around the world. If you have started using the Display Pack, please send your photos to Doris Low at Center Services so that that they can be shared for inspiration. And if you have not used it yet – well, why not? Your feedback will be most welcome! Blissed-out participants at Light of the Path retreat. 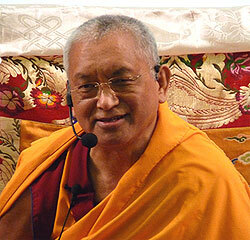 Rinpoche gave fantastic teachings on the motivation for life, guru devotion, impermanence, karma and emptiness. So that routine activities might be transformed into dharma, Rinpoche advised on daily mindfulness exercises for contemplating while one is walking, eating, driving, working, etc. Rich in detail and incisively relevant, Rinpoche’s commentary served as an overview and introduction, without actually getting into Lama Atisha’s text. Rinpoche promised that next year, he will do that. Rinpoche also led the chanting for the whole Lama Chöpa puja. In regard to the tunes, Rinpoche said after the retreat, “I didn’t do the special chanting of the absorption of the guru at the end of Jorchö or the request to the lineage lamas [because] it is good for more Sangha to know this well.” So calling all Sangha, if you didn’t make it this year….! The staff and volunteers of Kadampa center who had put their hearts into making the retreat as enjoyable and stress-free as possible for the participants received high praises, and there were many nods of approval for the much vaunted ‘Southern hospitality’ extended to the guests who came from as far away as Europe and Asia. For those of us who didn’t make it, there’s next year’s event to look forward to, and the excellent video and audio recordings are still available online (as described above). Maitripa College re-opened in September, welcoming a fresh cohort of eager students. What broke new ground this year is that Maitripa has obtained the approval of the US government to enroll international students. The Portland–based College thus welcomed newcomers on student visa from France, Iceland and China. It has accepted students from Australia and Romania for the coming spring. As Yangsi Rinpoche draws an ever-increasing international audience and the reputation of the College grows in stature, the influx of foreign students can be expected to rise. As with all FPMT education, Maitripa College emphasizes academic learning with personal practice and community service as essential components of the students’ training. The current student register includes newcomers and graduates from the MA program who are finishing their Tantric Certificate year. Tushita Meditation Center, Dharamsala, India is looking for volunteers for several positions, including help to do multi-media recording at the Hayagriva Retreat to be led by Rinpoche in March 2010.